What do all those ratings on the glass mean? NFRC Certified (upper left corner) indicates that the National Fenestration Ratings Council has licensed the window's manufacturer and certified the window's performance in accordance with NFRC's standards. The upper right corner identifies the window's manufacturer, model, style and the materials used in its construction. The solar heat gain coefficient (SHGC) indicates how well a product blocks heat from the sun. The SHGC is the fraction of incident solar radiation admitted through a window and absorbed and subsequently released inward. SHGC is expressed as a number between 0 and 1. Again, the lower the number, the better: A low SHGC means the window transmits less solar heat. Visible transmittance is an optical property that indicates the amount of visible light transmitted. VT is expressed as a number between 0 and 1. The higher the VT, the more light is transmitted. For more information on NFRC ratings, visit the organization's website at www.nfrc.org. What Are Argon Gas-Filled Windows? Argon gas windows feature a sealed unit, filled with gas between panes of glass to increase energy efficiency. Because argon gas is denser than air, adding it to the captive air in double-pane windows improves thermal insulation efficiency. Used in conjunction with a special low-E (short for low emissivity) glass coating, argon gas windows bring the temperature of the window closer to room temperature. This process ultimately eliminates air currents and drafts that occur when differing temperatures meet. It’s natural to believe that your windows are the cause of condensation, but they aren’t. Windows don’t cause condensation; they simply prevent moisture from escaping to the outside and provide a highly visible surface on which to notice it. 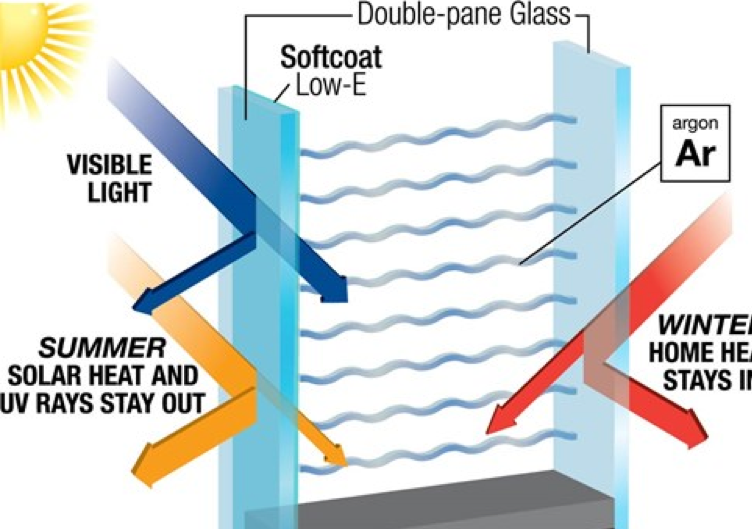 In fact, the “warm-edge” technology of high-performance replacement windows and doors can actually help reduce typical condensation buildup on glass. Nonetheless, while weather-tight, thermally efficient windows keep cold air outside, they also keep moisture in. Occasional, mild condensation is a normal event and causes no real problems. Even so, when you see excessive condensation on glass surfaces, take it as a warning that you may have excess humidity in your home. How can I reduce humidity? Vent all gas burners, clothes dryers, etc. to the outdoors. Be sure that louvers in your attic or basement crawl spaces are open and amply sized. Air out your house a few minutes every day. Tempered glass is defined as toughened glass that has been treated by heat or chemicals to increase its strength. Tempered glass has many benefits and uses which makes it a popular glass used in many home and commercial building projects. The most important benefit of tempered glass is safety. Tempered glass reduces the risk of injury due to its nature of breaking into small, circular pieces instead of sharp, jagged shards. Another benefit of tempered glass is its strength. Because the process of heating and applying chemicals strengthens the glass, tempered glass is an excellent choice for windshields, home windows and any other projects where maximum durability is desirable.